This is an essential guide to a fascinating technique, from a UK author. It features expert hints, tips, charts and diagrams. "Close-up & Macro Photography" is a essential guide to a fascinating technique, beginning with an explanation of the difference between close-up and macro work. 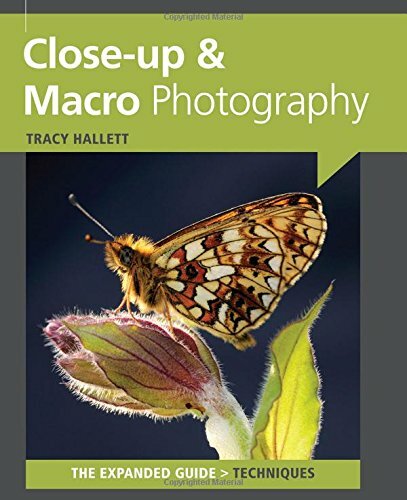 Aimed at the novice or more experienced amateur, this book describes the equipment for capturing true macro images, the 'macro' mode on standard DSLRs and the use of zoom lenses and dedicated macro lenses, among others. The theory of exposure and metering and light and flash is explained and there's practical advice on composition. It provides project ideas that include success with flower photography, capturing the textures of materials such as bark, abstracts and studio work with food and jewellery. It gives information on post processing explains file formats, raw conversion software, adjustments to contrast, brightness and shadows, understanding levels and curves, white balance and saturation, with helpful tips on removing imperfections and cropping for impact. Tracy Hallett is a former editor of Outdoor Photography magazine. Her work has been featured in over 20 consumer magazines, and exhibited at The Photographers' Gallery and The National Portrait Gallery in London. Tracy's recent projects include photographing all the wildflower species in Sussex, and visiting all of the offshore islands in Great Britain. She live in the New Forest in Hampshire, UK with her husband Dan.